“Tis the Season for Holiday Parties”! As we all know there is always that one employee who stands out from the crowd and behaves completely inappropriately at the annual Holiday Party. We have all heard tips of “How Not to Behave” hundreds of times before, however, according to the statistics below, company staff still aren’t listening to sound advice to stay out of trouble. SHOW UP. Don’t pass up the invitation to the annual Christmas Party; not attending could hurt your reputation. Dress appropriately. Remember “This is a Christmas Party” and “Work Function” not a Saturday night club outing with friends. Drink in moderation. 1-2 drinks at maximum. Excessive drinking could be cause for future complications within the workplace. Absolutely no gossiping about other co-workers – you never know who is listening. Keep in mind that with the evolution of social networking; news travels fast! Create a conversation that doesn’t involve business. Research current news and show your co-workers you have a life outside of the office. Don’t flirt. 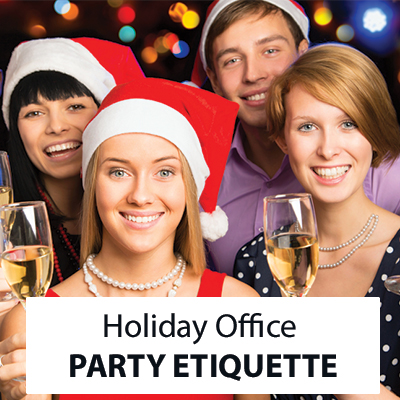 An office party is the #1 time NOT to try and swing a date from the girl from Accounting or the guy from Sales. Watch your language. More people than you think take offense to profane language. Keep the conversation light-hearted. Avoid Controversial topics such as politics and religion. Don’t overstay your welcome. Arrive shortly after the start time and mingle but don’t overstay your welcome by partying until the wee hours of the night. Send a thank you to the organizer of the event. They put a lot of effort into the event and deserve a letter/email of thanks. Article by: Rachel Mitchell of TorontoJobs.ca. TorontoJobs.ca is the on-line recruitment website where you can post your resume, search and apply to 100’s of jobs in the Greater Toronto Area. You can also get career, interviewing and resume writing tips all at no cost to you. TorontoJobs.ca also provides recruitment services. Since 2002, TorontoJobs.ca has been a local leader in job postings in the GTA. Check out www.TorontoJobs.ca or email your resume to resumes@TorontoJobs.ca.